Laurie Stasi published Shadow Painter, book about prophetic art. It is an instructional handbook for Christian artists that will help them grow in their calling. Many artists hear from God and incorporate what they receive into their art. To educate these artists, this handbook includes 33 categories of prophetic art. It contains exercises and Bible Studies for individuals and groups. Whether you are a painter, sculptor, photographer, banner designer or any other type of artist, this book will help you grow as a Christian prophetic artist. Shadow Painter explains the mission of Bezalel, the first person who was spirit-filled and chosen to create the objects of the tabernacle. It discusses wisdom, creativity, imagination and the amazing gift of accessing the heavenly realm. Shadow Painter covers spiritual principles relating to the supernatural. It gives guidance in creating small art groups, as well as personal instruction for living as a prophetic artist. This handbook encourages ways to take back the arts and how to intercede regarding the arts. If you hunger for God and want to use your creative gifts for Him, this book will support you in your quest. It will also help guide the beginner in learning to hear from the Lord. God is speaking through the arts in our generation! The Lord is speaking to me today about discipline. Sometimes, as artists and writers, we wait for the creative, or prophetic juices to kick in before we get moving. Instead, in faith we need to take the first step and go forward, trusting that the Lord will meet us in that place of surrender. The enemy’s strategy is to distract us from our most anointed work. He will put obstacles in the way and thoughts that make our mind wander and draw us to other less anointed projects. If he can take us away to second best, he wins, because second best is the enemy of the best. God wants the best for us, to accomplish His assignments. Always ask, “Is this project good, better or best?” In my case, we bought an old house that needs updating in every room. I can easily find work to do that feels like I accomplished something by the end of the day. It can be satisfying. But I have to strive for a disciplined life and limit how many hours a week I pour into the house. I have a project schedule for myself so that I will not stray from the God assignments. The Lord spoke to me, to “stick to the calendar.” It is still a struggle, but it is the formula for breakthrough. This is our fixer-upper, a 95-year-old foursquare house (taken when we bought it in 2015). I am holding Sophia, one of our 8 grandchildren, next to my husband, Paul. Old houses are tons of work, but they are very homey and beautiful. The Lord spoke to us related to the “Four Square” church, and shortly after we moved in, we went to a conference in California and were able to visit Aimee Semple McPherson’s church, Angeles Temple, the Four Square Church. One tip I recently heard at a writer’s conference was regarding technology. Author, Ron Carlson said he does not open his Internet, or emails, etc., until after 2:00 p.m. Technology has become an enormous time-waster in our society. Even if you want to just check your email, it probably will take more time than you thought it would. Who could have imagined 25 years ago, that people would spend endless hours doing email, Facebook, Netflix and other such time-sucking technologies? If we regulate, or better yet, fast these things from our lives, we gain countless hours in our week. Even when a writer is writing blogs, it feels like productive work, but if the Lord has called you to just write books, you are disobedient. Many times we hear that we need to market our work to get exposure, but balance is the key so we do not get drawn into endless cyber hours. Pray for a strategy of balance in every area, and God will lead you to success. “For the Lord your God will bless you in all your harvest and in all the work of your hands, and your joy will be complete,” Deut. 16:15b. The man also shows the response to his love for Christ. Jesus said, “Take up your cross and follow me.” This man carries his own cross in obedience and love. It is painted with very subtle, neutral colors. The palette is tans/browns and dusty grey/blues. 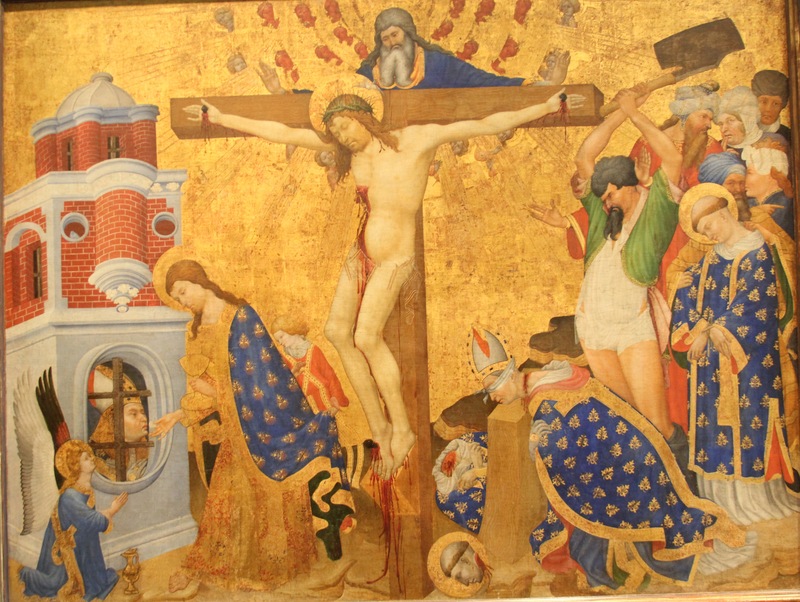 The Painting has a background, and a foreground (no middle ground). The Composition moves your eyes from the man’s face, up to Christ’s face, and then oval around the two figures. The use of lights and darks, brightness and contrast is very natural and creates a well balanced contrast. The brightest areas are the sky, Jesus’ shoulder, Jesus’ cloth, the horizon sky, and the feet/ground area. By studying other paintings and techniques we challenge ourselves to become better artists for the Lord. Use your gifts for God’s glory! Shadow Painter, prophetic art, revelation art, Christian Art. This type of prophetic art is done while painting and we let Holy Spirit direct all choices of paint, strokes, form and colors in the moments we are painting. There are many artists who paint during church services who are expressing prophetic art in this way. This may be done without a vision or image, just letting the Holy Spirit orchestrate the art. The results are abstract and free. They may express; images, emotion, color from heaven or the very heart of God. It is important to allow yourself to feel Holy Spirit’s lead and His anointing, and surrender yourself and your thoughts to allow Him to flow through you. Sometimes, it can be almost trance-like, where you are not conscious of making mental choices of color etc., but are completely led. In music, this is done with improvisation under the anointing. Many now “sing in the spirit,” hearing a tune and words from heaven and release it in song. This could also be done with rap for those individuals who have their art so fine tuned that they can just flow with rhyming words to the anointing. They are able to creatively release a message from heaven. This type of prophetic art is very similar to painting in the spirit, but the intent of the heart is totally engaged in worship. It is a giving mode, not receiving. The final results shouldn’t matter to people around us. It is an offering of worship to God. You may paint from an image from a vision, or it may be free flow of painting in the Spirit. This is the highest form of prophetic art. It is an act of love. This, of course, can be done in music, or any other medium. I prophetically sing in my kitchen while unloading the dishwasher, purely as an offering of worship. Some things we create are for God alone. They are a fragrant worship offering. The Greek word in the New Testament for worship is “proskyneo.” It can mean to kiss the hand, as a token of reverence. Another meaning is to fall upon the knees and touch our forehead to the ground. We can let our creativity become kisses of adoration and bowing in surrender to Almighty God. We can put our gifts before Him as an offering of love. I once saw a vision of a pomegranate, and the Lord showed me that it was about intimacy with Him and His desire for me. Soon after this, I was asked to paint at a small worship meeting and felt I needed to paint the pomegranate. I set up in a back corner, which is uncommon. Usually prophetic artists are near the front. But I was not painting this one for the audience to receive a message; I was painting as a gift to the Lord. It was the most incredible time with Jesus. I could not stand; I kept getting rocked by God. I painted pomegranates as my gift to Him, painting in pure love. David spontaneously danced when the ark was being brought into Jerusalem. His dance was a pure act of worship. He was filled with celebration as the Spirit overcame him with joy. We can paint in the spirit without any earthly paint. Just use your spiritual eye and reach for heavenly colors and paint in the heavenly realm. This painting is recorded in heavenly galleries. It feels much like play, and the Holy Spirit loves it. You are painting by faith for the Lord. Sometimes we have to learn how to come like a child. This is a good exercise for prophetic art groups to break off rigid thinking and become kids again. Some art is to draw others into worship. The act of performing the art is a creative form that allows the process itself to become a performance and corporate worship to the Lord. Art can be executed in many creative ways. My husband and I were given tickets to see Trans Siberian Orchestra. They present music with extravagant presentation of: lights, visual images, smoke and fire. It is a wonderful experience in creativity. The way we present worship can be an extravagant experience to glorify the Lord. He is worthy of splendor and spectacular display. I painted at a women’s worship meeting yesterday and painted this painting. Several months ago my husband and I were in France. We had particular interest in visiting sites where the Huguenots had been martyred. In one of the cities we saw a clothing shop with a rotating mannequin in the window. It wore a white dress that had sketches of dresses pinned to it. I took a photo. I was drawn to it, believing the Lord wanted there to be sketches of churches on it. He also spoke to me the word “trousseau.” It is a dowry, or an outfit of the bride. It can be a hope chest, glory box or its contents. I believe the Lord wants to give the Bride a trousseau. He wants her adorned as the beautiful Church. The fact that the dress was rotating, means to me that there have been seasons when God has given out these beautiful gifts, and it is coming around again! On our trip we visited many beautiful churches, basilicas, and cathedrals. They are so stunning as they let in colorful light through their stained glass windows. I love the magnificent architectural elements, the gothic arches, the stone carvings and massive wood doors. God wants to bring beauty back to the Bride of Christ. He wants to give her a “hope chest” of blessings, glory and beauty. He wants the very structure of the Church’s spiritual character to be beautiful. As a side note: the Huguenots were known as being artists and craftsmen. SHADOW PAINTER is a book to help prophetic artists understand their calling and grow as artists. Chapter 4 includes 33 types of prophetic art. I would like to briefly highlight one of them today. 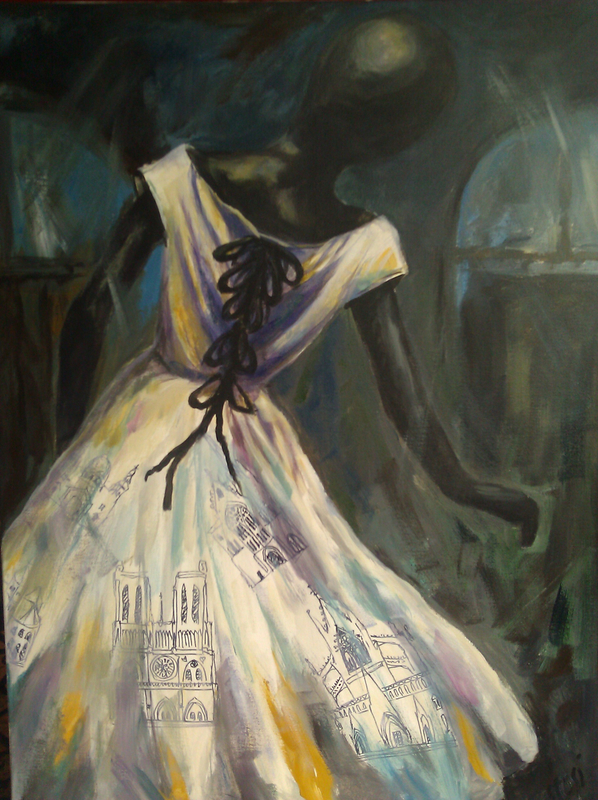 Painting in the Spirit is “painting and letting Holy Spirit direct all choices of paint, strokes, form and colors. There are many artists who paint during church services who are expressing prophetic art in this way. This may be done without a vision or image, just letting the Holy Spirit orchestrate the art. The results are abstract and free.” As you can see, in this specific category, it is not pre-meditated. The object is being a vehicle for the Holy Spirit and His freedom of expression. Is painting in the Spirit your main form of prophetic artistic expression? For our first discussion artwork, I chose this piece by Jean Schormans. I saw it on a recent trip to Paris. It was a large painting, hung above another large piece, but it caught my husband and my attention. The emotional response was probably what grabbed us first. You have a group of boys, from another generation, being typical boys. There is a ringleader standing confidently with his feet apart, (body language is important!) and the followers. We related to this on many levels, as we run a drug rehab program, you always have the ringleaders and followers. Jesus also was a leader, and had His followers. Notice the coloring, it is filled with soft gray blues and tans. It has good contrast, with the blacks strongly grounding the main subject. The alley line on the right leads your eye into the piece. It is softy realistic, loosely painted. Where does your eye go when you view the piece? The composition is simple, so your eye doesn’t travel based just on the composition, but it follows the action. We notice the hands, the eyes and expressions. You may want to copy this piece and learn from the painting technique, or even just a small study of one of the heads. Enjoy! Leave your comments on this artwork, I would love to hear from you! BUILDING BETTER ARTISTS – JUNE. via BUILDING BETTER ARTISTS – JUNE. Have you noticed that a lot of prophetic art is very amateur? The message from the Lord may be clear, but the skills of the artist need to be developed. I will address this issue in upcoming posts by sharing a copy of a master work, and then discussing it and leaving it open for comments. When you study art in a good art school, they will have you copy a master work to learn from their style and technique. It is amazing what we can learn from years of study of Rembrandt, Degas, or the line work of Da Vinci by looking closely at their work. Look for upcoming posts, MASTER MARKS, and grow in your art!!! I worked on this book for over five years, collecting treasured words and instruction that the Lord was speaking. God wants the arts to be taken back for His glory! He wants the prophetic word to be released! He wants the prophets to rise up and grown in their calling! HOW EXCITING!!! 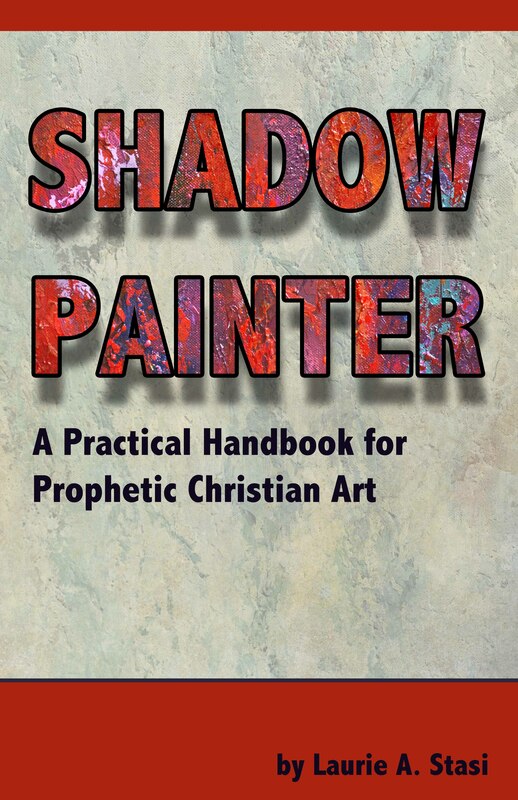 The aim my new book SHADOW PAINTER, is to help prophetic artists in every area of art to understand the vast possibilities in doing art for God. SHADOW PAINTERincludes 33 types or categories of prophetic art, 29 exercises, and 24 Bible Study topics to develop your prophetic artistic gifting. SHADOW PAINTER will also help others in the church understand what prophetic art is, and why God wants the body of Christ to embrace the Father’s gift of creativity. I hope to encourage artists in the lifestyle of the prophetic, and give helpful direction in hearing from Him and interpreting their visions. The Bible gives us solid understanding of the prophetic and the arts. SHADOW PAINTER stands on scriptures to present topics related to art, imagination and creativity. Christian artists should know what the Lord says related to these subjects so they can be the most effective in their callings as artists. I pray that as you read this book, God will anoint your creativity, and you will find more ways to use the arts for the Lord’s glory. Whatever your field of study, weather it be the visual arts, music, cinema, calligraphy, banners, photography, dance, writing, drama, etc., Shadow Painter will give you information that will stretch you and help you grow in your creativity. As I wrote, I frequently put information in context of visual art, but please apply the principles to your creative medium. The Lord has precious revelation He wants to release to our generation. He has prophetic guidance and wisdom He wants to impart to His children. I pray that churches will embrace the arts, and the artists in their calling as they release a message from heaven. I encourage artists to fearlessly go forward with the message they have received. The world has had an evil grip on the arts for too long. Its time we take them back and offer them as a sweet sacrifice to our Savior. SHADOW PAINTER will give direction and guidance and together we can create for the Lord’s glory.